What makes Hell so much more fun than Heaven? This is the text of the talk I gave on Hell on 16th November. If you prefer you can listen to it on https://youtu.be/NgpwXnLowj4 . It is mainly about Christian beliefs about Hell, how they have developed, how Hell relates to Heaven and what these beliefs mean to people. As the newsreaders say, there will be some distressing scenes. I include them because eternal punishment in Hell is still being preached in Liverpool today, and I think church leaders ought to reflect on what they are doing to people. Personally I do believe in some kind of life after death, but I think eternal Hell is the most socially destructive theory ever invented by the human mind. If I believed in it, I would be too terrified to give this talk. When I was six, one day on the way home from school, my elder brother, who was seven and knew everything, explained that when people die, the good ones go to heaven and the bad ones go to hell. Ooh. ‘What about me?’ He reassured me. ‘When children die they always go to heaven.’ By the time we got home I had thought it through. I told my parents my decision to commit suicide forthwith. As you can see they persuaded me not to. Apparently I was too young to understand the reasons. Whoever blasphemes against the Holy Spirit can never have forgiveness, but is guilty of an eternal sin. Apparently this meant eternal punishment in hell. I was petrified. I was the whole of 12 years old. I couldn’t remember whether in all those years I had ever blasphemed against the Holy Spirit. Added to my terror was a puzzle. The other seven boys who had heard this didn’t seem bothered in the slightest. Why not? So I asked my parents. They told me not to worry; I was still too young to understand. I must have been a horrible child. What will I do? There will be no work for our limbs; what, then, will I do?… Is this no activity: to stand, to see, to love, to praise? 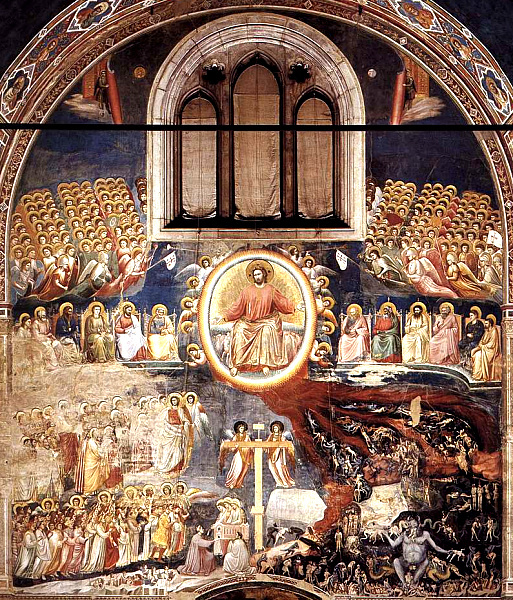 This is Giotto’s Last Judgment. There they are doing what Augustine said. You can see for yourself where the action is. In the corner is the Devil excreting a sinner. 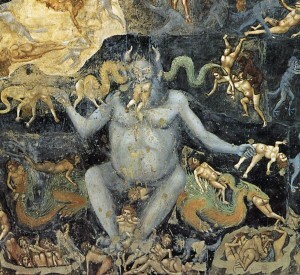 Here is Lochner’s Last Judgment, 15th century. Again, where’s the action? 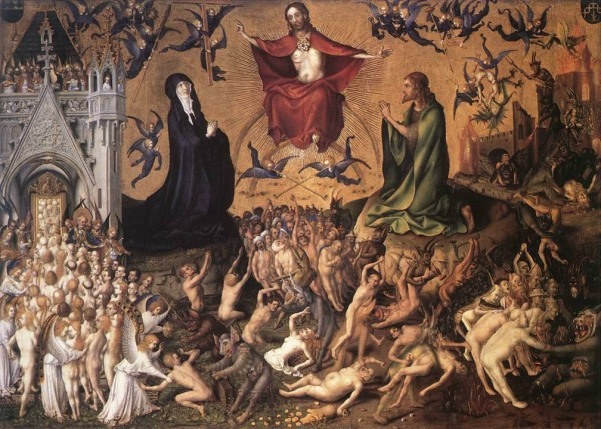 Memling’s Last Judgment, also 15th century. The concept of Heaven is instinctively understood as a metaphor, an inadequate attempt to convey the bliss or ecstasy of the soul dwelling in God’s grace, rather than a real address with pearly gates, harps, and halos. Hell, the place of punishment for sinners, has always been taken much more literally, perhaps because it is easier to understand. If Heaven is spiritual, Hell is oddly fleshly, with tortures that hurt. Heaven and Hell are only meaningful when we distinguish between the saved and the damned. Before that, our hunter-gatherer ancestors believed in some kind of life after death. Archaeological evidence takes us back half a million years. Why did they believe in it? 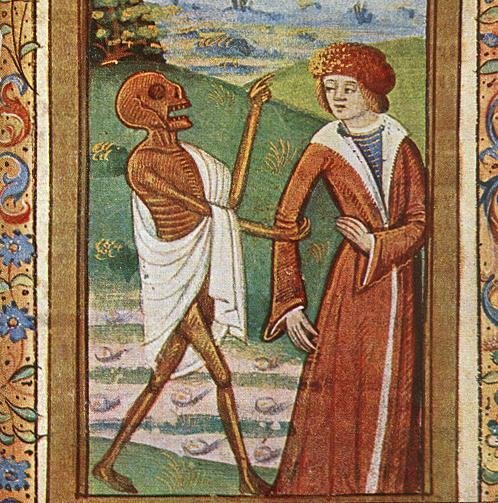 Probably for the reasons that people today find it hard to believe death is a complete end. When somebody you love and admire dies, does that mean that everything they achieved is now meaningless? And if it’s meaningless now, what sort of meaning can it have had before? We live our lives assuming that life has meaning, value and purpose over and above the pleasures of the moment. Most of us live as though there is something more. A distinction between those who are rewarded after death and those who are punished appears with Zoroaster and Plato. For Jews it became popular in the second century BC, after the Maccabean wars. The logic is: our martyrs died for their faith and deserve to be rewarded. Our enemies deserve to be punished. The rewards and punishments of the dead must be in another life. And in anger his lord handed him over to be tortured until he should pay his entire debt. So my heavenly Father will also do to every one of you, if you do not forgive your brother from your heart (Matt 18:34f). Those who worship the beast and its image… will be tormented with fire and sulphur in the presence of the holy angels and in the presence of the Lamb. And the smoke of their torment goes up for ever and ever. There is no rest day or night (Revelation 14:9-11). Other second century Christian documents describe visions of Hell. According to the Apocalypse of Peter, blasphemers will be hung by their tongues over a fire. Women who plait their hair to attract men for fornication will be hung by their hair, and the men who lay with them will also be hung. I won’t tell you which part of the body they will be hung from. You can probably guess. And so on with other sins getting suitable punishments. Mercifully, this book was not included in the Bible. Why all this? Islam began by winning wars and becoming the ruling classes. Christianity began with the impoverished and persecuted. It is typical of people embittered by oppression that they want their enemies to be severely punished. The more the better; but all they want for themselves is relief from the oppression. This is the Hell of the martyrs. Once when I was a curate an elderly parishioner summoned me to talk to her. She had been told she didn’t have long to live. I assumed she wanted to talk about what would happen to her after she died. When I got there, I found she wasn’t bothered about herself at all. What she was bothered about was the vandalism recently reported in the local newspaper. She wanted me to reassure her that the vandals would be severely punished in hell. About herself she had no concerns at all. I thought that was odd. I now know it’s normal. Augustine set the tone for western Christianity. By his time the only people persecuting Christians were other Christians. People still had visions of eternal punishment, but for a different reason. The key is Augustine’s doctrine of Original Sin. When Adam ate the forbidden fruit the entire human race was in Adam. This was before the days of modern biology. You and I were there. We share the responsibility for that first sin. We therefore deserve eternal punishment in Hell. 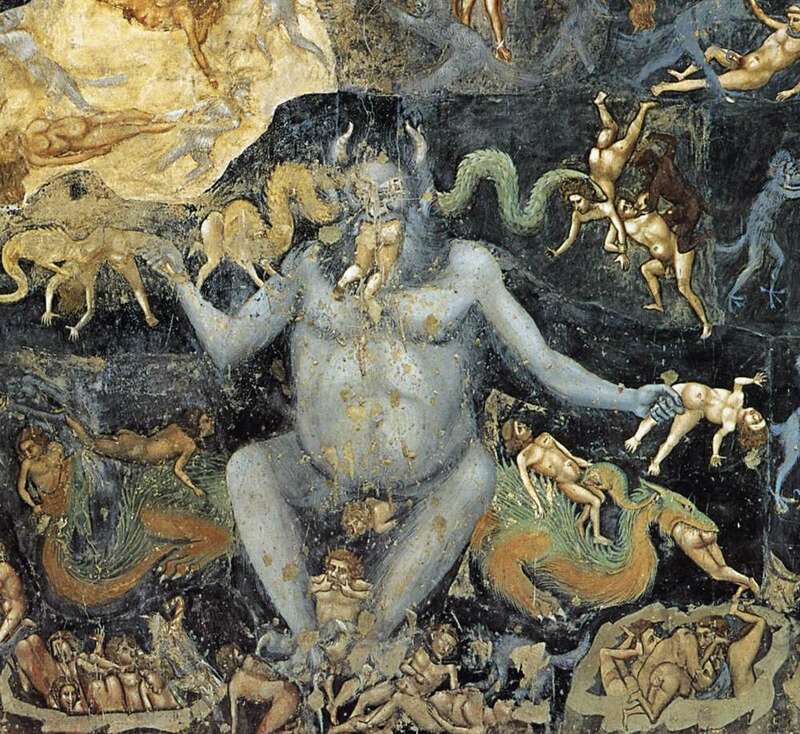 Hell, which is also called a lake of fire and brimstone, will be material fire, and will torment the bodies of the damned, whether men or devils—the solid bodies of the one, and the aerial bodies of the others. It follows that any amount of earthly suffering is justified to save you from it. This is how he justified declaring war on the Donatist heretics. This is no longer the Hell of the martyrs. It is no longer what the persecutors deserve. It is what the whole human race deserves. There have always been people with a gloomy attitude to life, but if we deserve eternal punishment we must be dreadfully sinful. What developed, especially in the monasteries, is an attitude called ‘contempt for the world’. Central to this contempt was a strong sense of guilt about sin. Sexual temptation was the most common theme, but they often felt guilty just for enjoying the ordinary pleasures of this world: nice food, pretty clothes. The most popular medieval account of Hell was the Vision of Tundale, written in 1149 by an Irish monk. 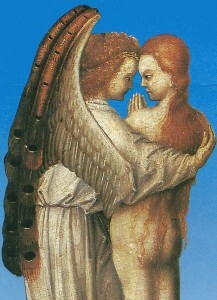 The illustration comes from the 15th century. An angel showed Tundale round hell. 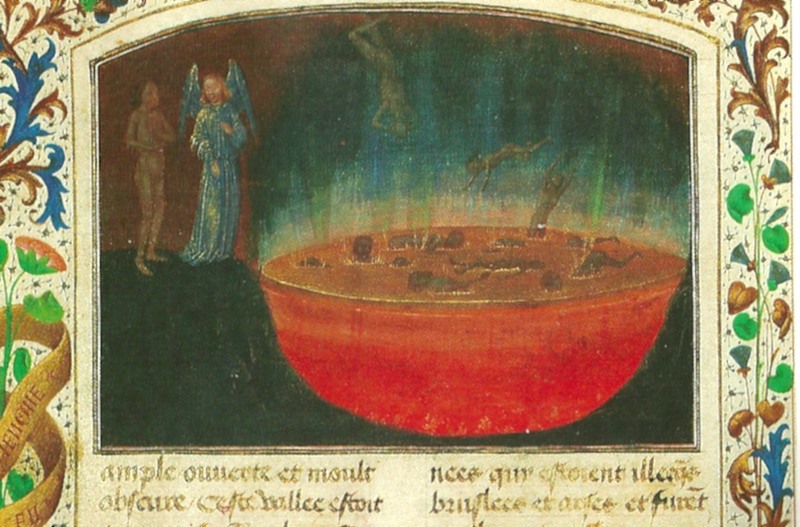 Here are people diving into a lake of fire. Elsewhere the angel reveals one type of torture after another. I’ll spare you the details. When it comes to inflicting pain, the human imagination is very fertile. Do we all really deserve all that? It just doesn’t seem right to give eternal punishment to people who are a bit evil, but not that evil. Purgatory makes punishment temporary. Limbo has two uses. One is for good people who lived before the time of Christ. The other is for babies who died before they were baptized. Augustine was adamant that unbaptised babies would be sent to Hell. Others refused to believe it. There must be somewhere else for them. Limbo. The trouble was, neither Purgatory nor Limbo were mentioned in the Bible. Hell was everyone’s favorite part of the mystery presentations. A scaffolding achieved by something as simple as a ladder might stand in for Heaven in an early production, but even the very earliest plays we know about give careful stage directions for infernal scenes—the twelfth-century Mystère d’Adam specifies chains, clouds of smoke, and the clatter of caldrons and kettledrums. Then came the Black Death. 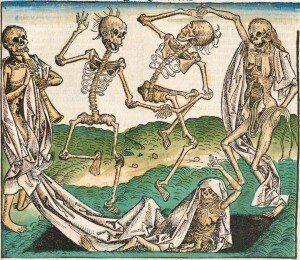 From the middle of the fourteenth century, for 300 years there was a series of plagues. They had an immense effect. This period includes the Reformation and the Counter-Reformation, so Catholics and Protestants alike have good reason to take offence at everything I am going to say. 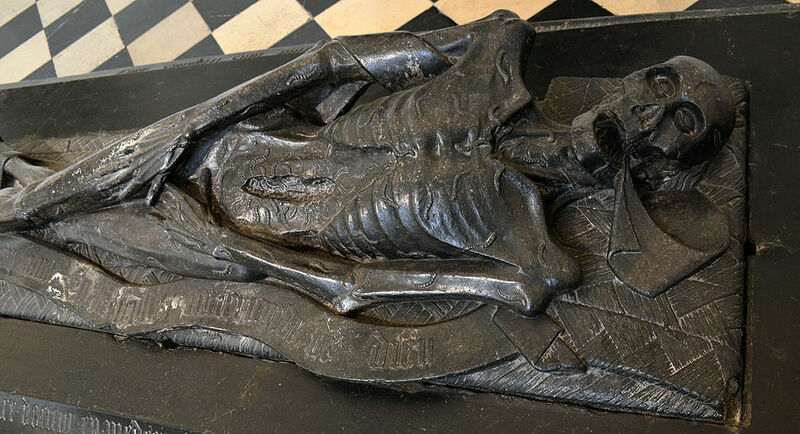 You may have visited old cathedrals and seen tombs, with an image of the dead person on top, usually looking solemn and peaceful. Here’s a French one from the fifteenth century. It doesn’t depict the person before death. It depicts the rotting corpse. There are worms eating it. Transi of Guillaume Lefranchois, 1446. From the Church of Saint-Barthélémy de Béthune, France, now at the Musée des Beaux-Arts d’Arras. Via Wikimedia Commons. This is called a transi. When so many people were dying that it was impossible to bury them all, rotting corpses would have been a common sight. The message is: one day you will look like this. These are danses macabres. They were common in the 15th century. When everybody knows that, even if they are in perfect health, they stand a good chance of being dead within a week, it makes you reflect. What is life? What am I living for? Is God angry with us? Monastic contempt for the world and the threat of Hell began to make a lot of sense. All over western Europe pictures of judgement and Hell were painted on church walls. In England the Reformers later whitewashed over them. Until they did that, every time you went to church you would be reminded of God’s judgement and the threat of hell. If a just and righteous God is going to torture sinners, godly governments should do so too. So they did. A German newssheet of 1603 describes the execution of two teenagers found guilty of murder. Boys and girls attended, as well as a great crowd of adults. In this torture, one and all admired the just judgments of God and learned from this example. I myself was witness to his torture, my father holding me by the hand. Making children see these tortures was considered a moral lesson. After all, they believed this was how God treated sinners. Who gets saved? There was uncertainty. Official Catholic doctrine, reaffirmed by Calvin, was predestination: God decided before we were born whether we would be saved or damned and there was nothing we could do about it. But the sale of indulgences presupposed that what mattered was how many sins you committed, and the wars against heretics presupposed that what mattered was what you believed. Man, the devil plays chess with you, and he does his utmost to capture you at this point. Hold yourself in readiness, therefore, and think well on this point, because if you win here, you will win all the rest, but if you lose, all that you have done before will be worthless. These conflicting theories left uncertainty. Even though the majority were destined for hell, every individual could hope to be one of the lucky ones. On the other hand nobody could be sure. One thing was absolutely clear to everyone except the Anabaptists: if you weren’t baptised you would go to Hell. So what happens when you give birth and the baby dies before being baptised? Augustine was quite clear that that child is going to be tortured in hell for eternity. In parts of Europe there were ‘sanctuaries of resuscitation’. You take the baby’s body to one of these places. You light candles, say prayers, celebrate masses, and wait. At some point the baby’s body will move in some way or other. This proves that the baby has come back to life. The baptism is performed, and even though death returns soon afterwards, hell has been avoided. Imagine being a mother feeling the need to go through that! Unless we bear in mind the obsession with salvation and the fear of hell that motivated the people of the Middle Ages, we shall never understand their mentality. The biggest religious story of the 19th century was the increasing number of educated people who rejected Christianity. The main reason was that they couldn’t believe in Hell. The controversial book Essays and Reviews, published in 1860, contained two essays by Church of England clergy who didn’t believe in Hell. There was a major public storm. They were prosecuted. 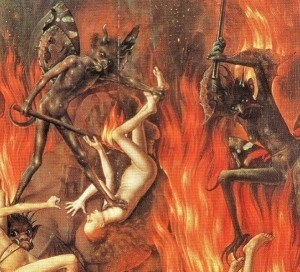 Eventually the court concluded that it was legally permissible for clergy not to believe in hell. The doubts were not universal. The educated classes might disbelieve, but they were very keen to ensure their servants did believe. Otherwise they might disobey. The same applied to children. Victorian parents often gave their children books describing heaven and hell. The most popular were the books by the Roman Catholic priest Joseph Furniss, first published in the 1860s. They contain descriptions of children suffering eternally for their sins. I’ll just give you one. A girl is wearing a bonnet of fire. It is pressed down close over her head; it burns into the skin; it scorches the bone of the skull and makes it smoke… Think what a headache that girl must have… She is wrapped in flames, for her frock is on fire… There she stands burning and scorched; there she will stand for ever burning and scorched! When that girl was alive… she cared only for one thing, and that was dress!… And now her dress is her punishment. These books sold in millions. In other words, millions of parents positively wanted their children to read them. It doesn’t work. 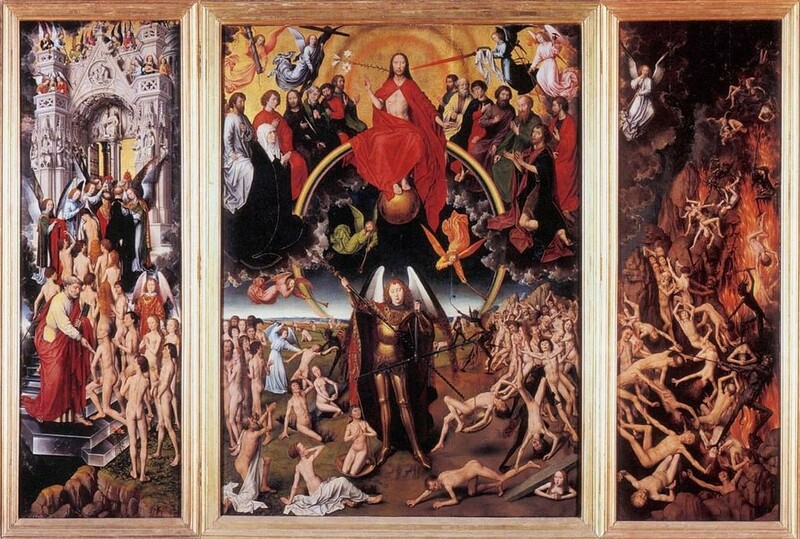 Look at Lochner’s Last Judgment again. On the left I am reminded of Freshers Week at the University. At the bottom left is an angel with an arm round one of the blessed. Look at the expressions on their faces. ‘Yes, don’t worry, you are in the right place. When you get to the top of the queue someone will tell you what to do.’ I guess we could all imagine ourselves doing the job of that angel. 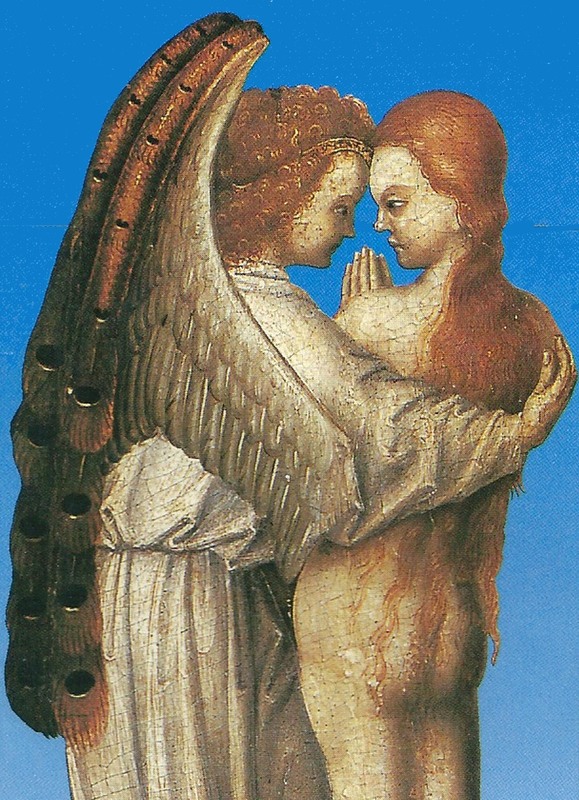 But what about the other angels, whose job it is to drive the damned into Hell? If you had that job, what sort of expression would you have on your face? Or would this be more like it? 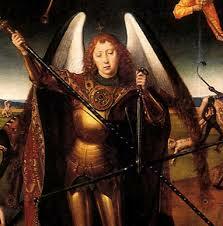 And what about Memling’s St Michael, as he drives the damned into Hell. If he was applying for that job today, he’d have to say he was passionate about punishing sinners. Would these be more likely to get the job? This is the problem. The artists face an impossible job. The theology is all wrong. 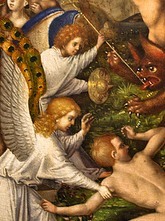 The demons perform two roles. They are both God’s enemies and God’s agents of punishment. They can’t be both at once. 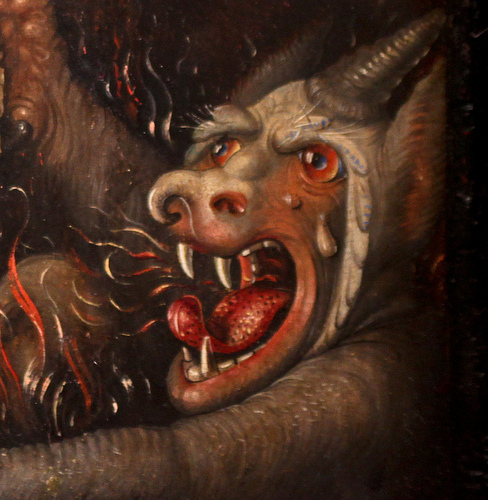 If Hell’s tortures are God’s judgement, God is just as hostile to us as the devil is. If they are the devil’s doing, contrary to God, then the devil is more powerful than God. Put the whole story together and somewhere along the line you have to include the impossible: holy, cuddly obedient servants of God driving people to eternal torture. Hell is built on a contradiction. In modern debates about how the law should punish there are three main approaches. Some argue that punishment is there to deter, some that it should have a positive aim of helping the offender live a better life. Purgatory is often described as a process of reform, preparing people for Heaven; but if Hell is eternal, the only possible justification is retribution. The idea of retribution is to put right the moral balance after an offence has messed it up. It is defended as a requirement of justice. On this theory punishment should be not too little and not too much. When it has been completed the moral order, and the moral status of the offender, are back where they were before the offence was committed. This theory influences penal policy today, but is far from being the whole story. It leaves us with two problems. One is that we don’t have to accept it at all. One common religious theme is that God is calling us to overcome our selfishness and do good for the sake of other people. If we are to be punished for our offences, every good act will also be a selfish act, a way of avoiding punishment. Perhaps retribution just expresses an evolved instinct for retaliation and revenge, and we would be better off resisting it. The other problem is that if retribution makes sense at all, it has to be commensurate with the offences and end when the offender still has more life to live. Theologians who defend it usually appeal to Augustine’s doctrine of Original Sin. An example would be John Stott’s immensely popular book The Cross of Christ, which stresses that we are all very very sinful and really do deserve eternal punishment. But are we really that guilty? To conclude. It seems to me that Hell appeals to the worst elements in human nature. We enjoy thinking about the punishments inflicted on our enemies. It’s fascinating. But it also instils fear and traumatises people. Heaven has two roles. One is that those who believe in Hell need Heaven as a foil, an alternative destination. So long as it is better than Hell, that’s all that matters. Alternatively Heaven can be nothing to do with Hell. It can transcend the tradition of dividing people into the saved and the damned. My own view is that our hunter-gatherer ancestors were right. They believed there must be some continuing life after death. We don’t know what it is like. What we do know is that the forces maintaining our present life are beyond our understanding. In order to get on with our lives we have to trust them. Maybe we should also trust them for whatever happens next. You will have your own thoughts. Here are some questions you may like to consider. • Do you believe in life after death? • Do you believe in rewards after death? • Do you believe in punishments after death? • Do you believe punishments after death are temporary or eternal? • Do you wish you knew more, or are you content to find out when the time comes?